In late spring of 2014, land beautifully nestled between the Atlantic Ocean and the Intracoastal Waterway was discovered for development by Newberry Homes in the quaint town of Ponce Inlet, Florida. A timeless vision for a distinctive beachside subdivision of Key West style architecture eventually emerged and Ponce Inlet Key was born. Newberry Homes collaborated with the architectural firm, BHM Architecture, to create the perfect vision for an exclusive beach community of only 5 single-family luxury homes on a private drive. To capture the charm of Key West, each 2-Story and 3-Story home features metal roofs, sultry island colors, expansive balconies, and rooftop terraces with intricate gingerbread detail and spectacular views. Ponce Inlet Key homes have been designed for relaxed beach living and for the whole family to enjoy. The main living areas feature inviting open-concept floor plans that make it easy for families to spend quality time together and for entertaining guests. The upstairs features split floor plans for everyone’s privacy and includes a Master Suite that opens onto a balcony designed to overlook breathtaking water views. Each home also features a rooftop terrace, providing everyone with magnificent views of the Atlantic Ocean and/or Intracoastal Waterway. Meticulous detail went into designing the floor plans of Ponce Inlet Key and to allow for clients to customize each home to meet their unique lifestyle. 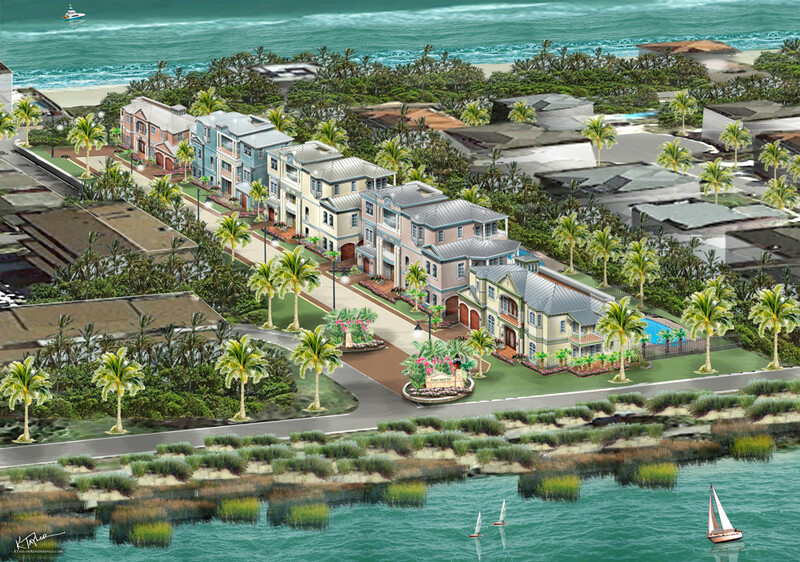 Whether it is to include an elevator for the convenience of relaxed living, or to have wet bars and outdoor kitchens for entertaining family and guests, Newberry Homes provides options for each resident to help in designing their perfect beach home within Ponce Inlet Key. After securing the land in late 2014, Newberry Homes started working with the town of Ponce Inlet and are now in the final stages of permitting. They hope to break ground soon and begin construction in Spring 2015. Learn more at the Ponce Inlet Key website.